Dr. Leroy Howell has been a member of the Suffolk community for most of his life. He attended Chuckatuck High School before going to Elon College in North Carolina, where he graduated with a Bachelor of Arts degree in chemistry in 1951. He returned to Virginia to study dentistry at the Medical College of Virginia, where he completed his doctor of dental surgery degree in 1955 and oral surgery internship in1956. Later in 1956, Dr. Howell joined the U.S. Army Dental Corps and subsequently served in the U.S. Army Reserve until 1964. 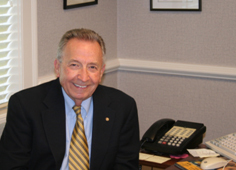 During that period, he also began the private practice in Suffolk that has become RL Howell DDS & Associates. Dr. Howell is actively involved in the Suffolk community and participates in many civic organizations, including the Rotary Club of Suffolk (member since 1964), the Chuckatuck Ruritan Club (member since 1959), the Boy Scouts of America;Colonial Virginia Council, the Suffolk Chapter of the American Red Cross, the Elon College Board of Trustees, the United Church Homes & Services, and the NationsBank Advisory Board. Dr. Howell is also an active, lifelong member of the Oakland Christian Church. Through the church he continues to provide many services to the congregation and the surrounding community. Dr. Howell is the past chairman of the board of deacons and previously served as the church moderator. Dr. Howell has also been a member of the Long Range Planning Committee since 1996 and has enjoyed teaching at the Oakland Christian Church Sunday School since 1959.